I come from a long and distinguished line of bad backs. I can trace this trait back on both my maternal and paternal sides of the family tree. Apparently, being Armenian comes with more than just a love of backgammon and rice pilaf. My father won two Purple Hearts in the Korean War and this injury further exacerbated the inevitable genetic back issues. I remember when he was almost eighty years old, a doctor going over an MRI said, “Honestly, it’s a miracle he can stand, much less walk.” Being that my dad was my own personal hero; I was not at all surprised by the doctor’s comments. My own back pain debacle started about eighteen years ago, when I was horseback riding, and my saddle slid off sideways, and I made a not so graceful kerplunk flat on my back on some nice soft rocks underfoot. “Never quite the same after that.” is my standard description, but years later when severe stenosis met spinal compression and arthritis, causing horrible lower back and leg pain, I found myself inches from scheduling a full fusion surgery. You have to realize, I fainted getting my ears pierced, in order to appreciate how much pain I must have been in to consider surgery of this magnitude and that came with a six month recovery time. It was the haunting words of my grandmother, “Never let them touch your back!” that rung in my ears. A woman, who at seventeen years old, survived genocide and marched out of a war torn country gives you advice, you listen. I did what I always do when faced with a problem. I broke out my shot gun approach. I hit it from all sides until I figure out what works. I tried physical therapy, chiropractors of all sorts, massage therapy, spinal decompression on this stretching rack torture device called the DRX 9000, pain patches, transdermal pain relief, rubs, and well, you get the idea. I finally gave into a cortisone shot, and used the time when the pain subsided a bit to move on to acupuncture (remember the needle phobia with the ear piercing, this was a huge step for me! ), cupping (my dark purple circles were the talk of the pool club we belong to! ), and a sports medicine therapist. I’m happy to report that all of this brought my back pain from one end of the little pain chart with miserable face to well not quite the other end, but a more manageable half smile face. My shot gun approach was really got me to the right place to lose weight too. I had tried every thing: Weight Watchers, Diet Workshop, Nutrisystem, Jenny Craig, Metabolic Designs, South Beach, Slim Fast, God knows what else, and even Fen/Phen (biggest mistake ever!). After my one size fits all robe didn’t fit at the day spa, I began my next full on assault on fat, and finally found what worked for me. For exercise, I had typically only tried cardio aerobics and walking, and weight training was truly life changing for me. I also realized for my diet, that there are some foods I simply can’t have a little of, which is why I broke up with bread and pasta and their little white starchy carb friends too. The point is that there’s always something new to try. If one thing doesn’t work, it doesn’t mean nothing will. What worked for you in the past may or may not be the best route for you today, or tomorrow. While battling my back issues, one of the doctors I had seen recommended I try Gyrotonics. It was created as a “yoga for dancers” to “heal injuries and damage sustained” and as an “exercise system rooted in spinal motion.” I think it helps with lengthening the spine and articulation of the discs. When I was in the worst part of my back pain issues, I modified my workouts. I swapped out biking for walking and lightened up my weights to reduce additional stress on my lower back, so I welcomed trying something new that could help. 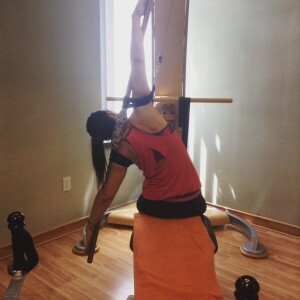 When I first met my Gyrotonics instructor, Ashley, I heard she also ran a ballet school, and that made sense, as the form of exercise, like Pilates, was started by a dancer. Ashley couldn’t have been nicer, and I remember I started taking sessions right after my weight loss success story was featured in Good Housekeeping Magazine. I remember showing her the article, and her really looking at it. She seemed very interested in the article and pictures. After we became good friends, it finally came up that Ashley was Ashley Richardson, a famous super model that had graced the covers of Vogue, Cosmo, Elle, Sports Illustrated, and many others. I laugh until this day that there I was proudly showing her my Good Housekeeping feature!! Ashley has me trying all kinds of equipment to continue to strengthen my back. You can see from the pictures how some can test your coordination. I still tease her today, that she may have been on the cover Vogue, but I was in Good Housekeeping and Soap Opera Digest!